Ah-ha! Tricked you! You thought you were looking at a hearty bowl of mashed potatoes didn't you. Nope, it's actually mashed cauliflower! Using cauliflower to replace mashed potatoes has long been known to low-carb dieters. This recipe gets this side dish from your pressure cooker and immersion blender in just a few minutes. The flavor is so incredible you won't miss the mashed potatoes. 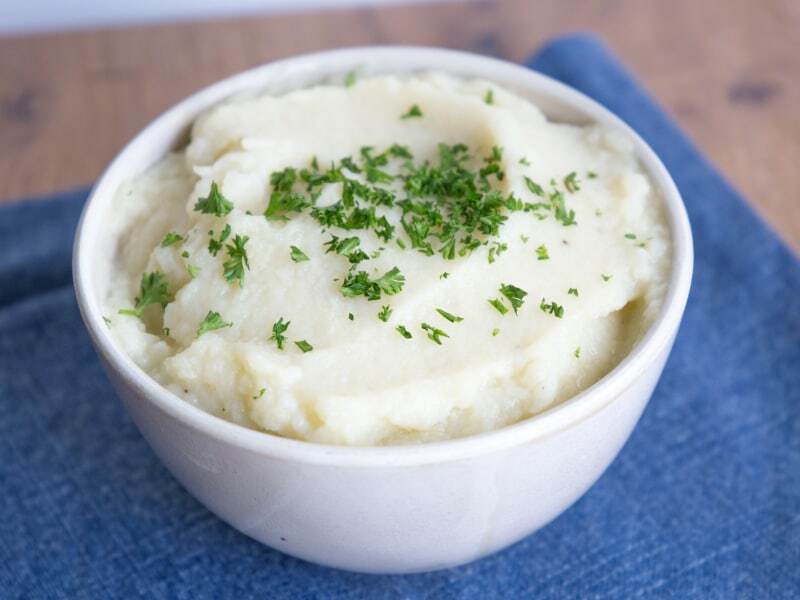 In fact, this recipe for Pressure Cooker Mashed Cauliflower just might be a new family favorite! Pour water into the inner pot of a pressure cooker. Place trivet over water and lay cauliflower head onto the trivet. Seal lid on pressure cooker, turn steam vent to Sealing, and cook on High Pressure for 8 minutes. Immediately turn steam vent to Quick Release the pressure. Remove trivet with cauliflower head. Drain liquid from the pot and return to base. Return cauliflower to the pot with the ghee, salt, and pepper; blend with an immersion blender until smooth. Using ghee brings out the inherently nutty flavor of the butter. 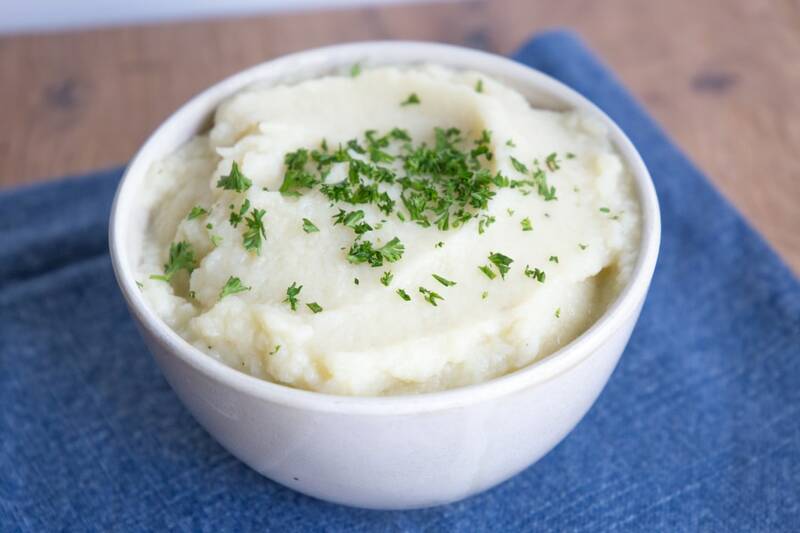 This additional flavor boost takes the mashed cauliflower to a whole new level! For fancy presentation, feel free to garnish the mashed cauliflower with your favorite fresh herbs or even a dash of paprika. Per Serving: 62 calories; 4g fat; 6.1g carbohydrates; 3g protein; 8mg cholesterol; 158mg sodium. Look, this does not replace mashed potatoes. Nothing can. 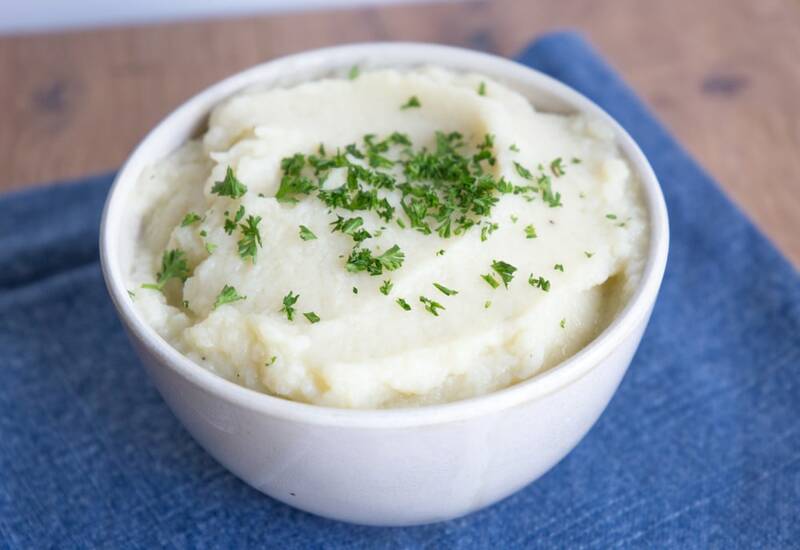 Mashed potatoes are what people have mashed for years because they are superior for that. I wish people would stop with this notion. If you accept from the start that this is its own dish, however, it's great! Just don't call it "mashed faux-tatoes" or wahtever! and add cheese because cauliflower loves cheese. Cream cheese melts into this perfectly and greatly helps the texture. I made this mashed cauliflower and I'm impressed by how much the taste resembles potatoes. I used butter instead of ghee, but other than that didn't make any changes. It was delicious. Healthy, delicious, and easy to make in a pressure cooker. The ghee is perfect for my Whole 30 diet too. Great recipe! George is right - this does not replace mashed potatoes. But it's delicious in its own right. I used dairy free butter instead of ghee, and added a small pinch of garlic powder for flavor. This is so easy, and it's a kid friendly way to sneak in some vegetables without them knowing. Made this pressure cooker cauliflower, but the way my boys eat, it's closer to two servings instead of 4. I ended up making two cauliflower heads (separately), but it wasn't a big deal because the pressure cooker makes the cooking time super quick and easy.